Casa Milagros in Sayulita is a beautiful beachfront home that is a living sculpture, designed to showcase the incredible beauty of our unique, natural environment in tasteful style and comfort. The main house has two magnificent master bedrooms with extra large, en suite bathrooms. The bungalow (literally inches from the beach) is a extra large bedroom & huge bath. This incredible Sayulita home offers a total of three king-sized beds handcrafted in artistic style and two of the bedrooms have additional comfortable queen sofa-beds. One master bathroom is a miniature jungle with a wall of large boulders and many beautiful jungle plants. 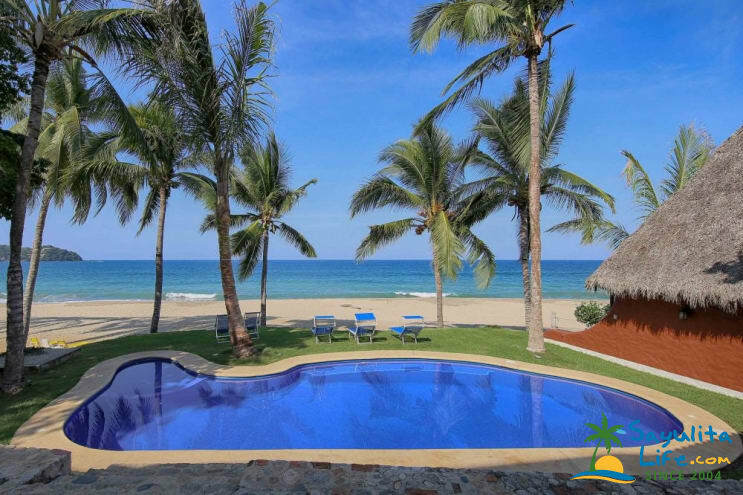 One of the only beach front homes in Sayulita with a private pool, Casa Milagros has the biggest and the best. The pool is located practically on the beach but behind palm trees to ensure privacy. Sit on the terrace with a margarita and watch the sunset of your life during most months. Consistently reported to be one of the most incredible beach front experiences you'll ever have. Bring your Ipod; there is a player at the house. Larger groups may wish to combine Casa Milagros with El Palacio to form Villa Milagros offering a total of SEVEN incredible master suites and eleven beautiful baths. We rented the Casa Milagros for our wedding in October 2018 and it was just amazing. The Casa Milagros was so beautiful with all the decorations and little details. It was a great location to have our wedding on the beach! And the Koi fish bathroom was a hit with all the guess and especially for the kids. The staff was amazing, they went above and beyond to make us feel like home. Super flexible and available when we needed them. Words can’t describe the beauty! From staff to view it’s simply perfect only wish I could of stayed longer! Make sure you find a way to book this house and experience it for yourself and stay as long as you possibly can! Marcos and his team exceded all our expectations. The villa was clean, comfortable and very relaxing. Great location to town. We rented a golf cart but also walked the beach. In a word the entire trip was wonderful. Just returned from week stay in casa Milagros. Have rented many properties in years past and this home has to rank in the top three. Location,Location is fantastic and the home is impeccable! Marcos and Lily have done outstanding work decorating and upkeep. The help is outstanding. Looked at all the villas for rent on the beach there and nothing compared to Casa Milagros for a three bedroom facility on north beach. You do need golf cart is a must. Highly recommend this property. Can’t wait to take family back in August. We all so enjoyed out time here. Great combo of wonderful lodging and delightful town. Owner and staff very helpful and friendly. Best spot on the beach without a doubt. Gorgeous, unique home. Perfect location. Fabulous experience. Casa Milagros was the absolute perfect choice. It's location couldn't be better. The quiet north end of the beach has a gorgeous view, but is easily walkable to town. (We rented a golf cart, too, because the hilly town walk was a little much for my small children. The homeowner helped us arrange it). The house is unique and so thoughtfully designed. My kids loved the koi pond in the master bath! The showers are luxurious. The little bungalow is a great private space for a third couple or a napping kid. The pool is lovely and maintained daily. It was so nice to have Irene there doing the daily housekeeping. She was a delight. We hired her to cook every night, and that was maybe the best part about the vacation (She's an awesome cook, and so accommodating. She even made a birthday cake for my 2 year old). The homeowner is extremely kind, responsive and helpful. It was such a great experience. We wouldn't stay anywhere else in Sayulita! We had the privilege of staying at Casa Milagros over New Year with my parents, brother, husband and a few happy children. My teenager..."Mom, good job finding this house!" As we all do, I looked at so many homes and having never been to Sayulita before I wanted a great location to explore the town but far enough for privacy - this was truly perfect! We dined al fresco every night. The staff, Irene & Fernando, were adorable and so helpful and polite. The owner was a dream to work with - true professional. The house itself it beautifully and tastefully decorated (pictures do not do it justice) with local art that you'll find in the local village shops. My parents enjoyed the quaint casita on the sand. We played cards, relaxed in heated pool, had a bonfire on the sand, watched the beautiful crashing waves, took long walks on the beach and even hired some talented massage therapists off the beach to come to the house! We absolutely enjoyed every minute of our stay and hope to return. Perfect beach house with casita and private pool. Marcos and his staff are an exercise in excellence. The property is constantly being improved on in minor ways, versus properties that get run down. Safe secluded perfection! I rented Casa Milagros and El Palacio for one week to celebrate my 50th Bday. There was 54 of us half from Brazil and half from USA. We all have traveled a lot and rented many vacation homes. We all have agreed this has by far been the best experience we had. The houses are simply gorgeous very comfortable and very well kept. The location is the best in Sayulita. It was hard to leave the grounds we had everything. Amazing views, ocean front. Simply fantastic! The staff, Irene, Araceli and Claudia are very nice and great cooks. They not only cooked for us twice but got all the grocery shopping done. Pepi and Fernando were great as well they took care of us as if we were family. This made our stay even more special. Thank you and your staff for everything!